At this point last year, Trevor Story could still dine uninterrupted at Snooze. He could take his high school sweetheart, Mallie, to the popular downtown Denver breakfast spot when she was in town, and they’d hardly garner a second look. When his big brother Tyler visited, they could chomp on eggs or pancakes in peace. Then, Trevor had one of the best starts ever to a major league career. He took two balls deep at Arizona in the 2016 season opener, becoming the first player in MLB history to hit two home runs on Opening Day in his major league debut. And he was just getting started. Story slugged another homer the next night, and then again the next day. 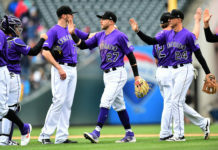 There were no long balls the following day because there was no game, but Story then crushed two more dingers in Denver during the Rockies’ home opener. It wasn’t until his fifth major league game that he failed to go yard. But then he touched them all again the next day. One week. Six games. Seven homers. An MLB record for the most home runs through a player’s first six games in the majors. In the midst of this historic week, with the city buzzing about the kid who emphatically took over the Rockies’ shortstop position, Trevor and Mallie grabbed a table at Snooze. A server who had waited on Trevor previously now recognized his customer – and finally mustered enough courage to ask for an autograph. Trevor obliged on a napkin. Not long later, during a brothers breakfast with Tyler, another Snooze server – or maybe the same one; they’re not sure – asked for Trevor’s autograph on the back of a receipt. Tyler watched in awe. “It’s a really weird situation because I don’t think of him as some type of celebrity,” Tyler says. To be fair, Trevor still has a lengthy path to navigate before achieving full-blown star status. He’s not yet the best player on his own team, and he’s only played 97 big league games. Just as we were getting to know this rookie phenom, his season was cut short with a thumb injury. But what Story showed in four months last year has the Rockies believing they’ll insert another power-hitting shortstop in their lineup for the next decade. The 24-year-old former first-round pick certainly wants to be that guy. Step 1: Prove the sensational rookie season was no fluke. Entering Spring Training a year ago, the shortstop position was very much in flux. The team traded one of the best to ever play the game, Troy Tulowitzki, to Toronto in July 2015, and in return received former All-Star Jose Reyes, along with prospects. Reyes finished out the year at short, but early in the offseason was charged with domestic violence after an incident with his wife. Two days before position players were to report for spring training the following February, MLB commissioner Rob Manfred placed Reyes on paid administrative leave until his trial began in April. The Rockies’ shortstop spot became an open competition. A month later the job was Story’s. He shined on defense and led the team in home runs. He was hitting .378 when then-manager Walt Weiss announced he’d won the gig. Story quickly called his mother, Teddie, to share the news. “Your baby is going to be the starting shortstop on Opening Day,” he said. “Those are the words you just wait to hear,” Teddie says. Immediately she went into action trying to assemble friends and family. 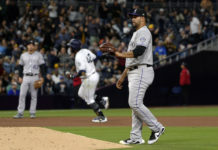 She and her husband, Kenny, had been holding vacation days, but didn’t know until Trevor’s phone call if they were going to Phoenix for the Rockies’ season opener, or Albuquerque, the organization’s Triple-A affiliate. When Phoenix became the destination, about 30 people made the trip. Hitting second in the lineup, behind Charlie Blackmon, Story grounded out to third in his first major league at-bat. Teddie was thrilled he made contact. Yet when her baby boy, with two runners on in the third inning, took the second pitch he saw from Diamondbacks ace Zack Greinke deep to right field, she couldn’t believe it. “Did he really just do that?” she asked her brother, who superstitiously sits next to her at games. Her stomach certainly wasn’t quelled by the smell of her son after the game. Trevor insisted on not making much hoopla, allowing only Teddie, Kenny and Mallie down into the tunnel. But before they got there, his teammates showered him with love – and apparently anything else they could find. 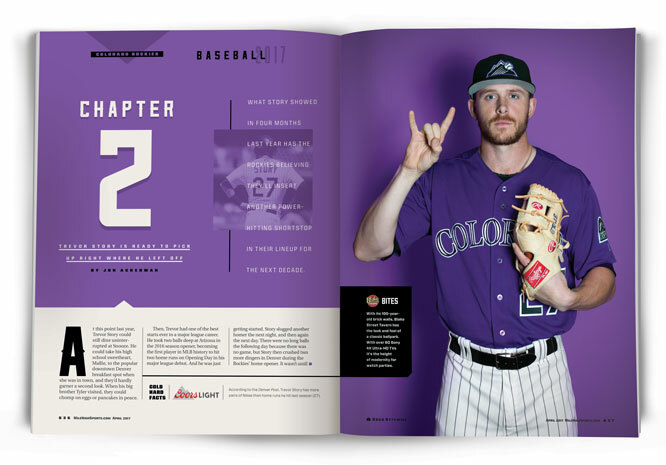 Two games and two more home runs later – and after he complied with the Hall of Fame’s wish to display his helmet and batting gloves from the historic debut series – Story made his first appearance at Coors Field. As he stepped to the plate in the first inning, he received a standing ovation. His parents and other friends witnessed that, too. Eventually the torrid home run pace cooled, but he maintained solid production. Wherever Reyes was at the time, he started to become of little importance to the Rockies. The commissioner eventually suspended him without pay through May, at which point the Rockies sent him to Albuquerque. The team released Reyes two weeks later, opting to eat the remaining $39 million on his contract. Story had stolen his position. The rookie had to give it up at the end of July, though. He jammed his left thumb while reaching for the bag on a slide in New York on July 30, and later aggravated it diving for a ball in the field. The diagnosis: A torn ulnar collateral ligament. Season over. But at the time he went out, his 27 homers led all National Leaguers, and the rest of his numbers sat him squarely atop the NL Rookie of the Year race. Story ended up fourth, with the award going to Dodgers shortstop Corey Seager. Looking at the final stats, it’s easy to presume Story would have rivaled Seager had he played the full season. In 157 games, Seager hit .308 with 26 HRs, 72 RBIs, a .365 OBP and a .512 SLG. In 97 games, Story hit .273 with 27 HRs, 72 RBIs, a .341 OBP and a .567 SLG. Story wasn’t just a one-month wonder. While his April was one for the record books (10 HRs and a .261 average despite 37 strikeouts) and his May was one to forget (4/.259/39), he steadied himself in June (5/.284/28) and July (8/.288/26). By most every measurement, Story’s plate appearances were improving as the season wore on. Now it’s just a matter of continuing the upward trend. There’s no question about who’s manning shortstop this year – Story’s glove was just as strong as his bat, with a .977 fielding percentage that would have ranked sixth among all NL shortstops had he finished the year. But there are always questions around a player returning from significant injury. Story insists he’s back to 100 percent, with no lingering effects from the thumb surgery. He and the Rockies’ trainers intentionally took his recovery process slow; he wasn’t cleared to swing a bat until December. He did all his rehab in Scottsdale, home of the Rockies’ Spring Training facilities. If anything, Trevor’s time away from the game increased his drive – no surprise to those who know him best. This boy hasn’t been able to stay off baseball fields since he was a year old. Born and raised in Irving, Texas, outside of Dallas, Trevor trailed his big brother like a tail as soon as he could walk. That often proved challenging with Tyler, three years older, but it didn’t stop Trevor. They were two among numerous boys in their neighborhood. Many were Tyler’s age, many were Trevor’s age, but to Trevor, they were all the same. “Trevor didn’t understand that he was three years younger than Tyler. He just thought that kids went outside and played and they all played together,” Teddie says. When it came time for Trevor to take the field with an actual team, he did so with advanced awareness. When the 5-year-old budding T-ball star caught a line drive at shortstop with a runner on third, he knew to sprint over and step on third base for the double play, then keep jogging right into the dugout because it was the third out. Outside of the neighborhood games – of which there were also basketball and football seasons – the brothers’ age difference kept them from suiting up together until the end of Tyler’s senior year at Irving High School. With just three games left in the season, Coach Jay Malone brought Trevor, a freshman, up to varsity. Tyler remembers his brother at the plate, getting into an 0-2 count. Then he sent one deep to the wall. “When he hit this ball, I’m thinking, ‘He hit the ball out.’ And me, I was never really a power hitter or anything like that; I hit one home run my entire life. And I was thinking that this kid, he’s going to come up and his very first game he’s going to have one, figuring he was going to try to steal the show from day number one,” Tyler says. Tyler moved on to play Division III baseball at the University of Texas at Tyler. After one season with the Patriots, he transferred to the University of Texas at Arlington, calling it a career on baseball so he could focus on studying physical therapy. Meantime, Trevor joined the Dallas Patriots, a highly successful select baseball squad. If boys in Texas want to play at the highest levels, they usually start select baseball at 9 or 10. Trevor joined at 16. Initially assigned to the second team, it took only three games to get bumped up to the first squad. And before long, he moved from second base to shortstop. “And then it was just like all of a sudden, the coach told me, ‘Your kid can play for any team at any Division I college that he wants,’” Teddie says. A month after graduating from high school, Trevor was selected by the Rockies late in the first round with the 45th overall pick. His mom thought he’d have a few years of college “to do laundry and cook ramen noodles” and everything else young men need to figure out when they’re on their own. Instead, she found herself negotiating with lawyers and Rockies executives on her son’s first pro contract. Following 22 days of discussions, they settled on a $915,000 signing bonus. Trevor and his parents flew to Denver to seal the deal, and then he was off to Casper, Wyo., for rookie ball, while Teddie and Kenny returned to Texas, a bit stunned at the whirlwind they just emerged from. But they rested in knowing Trevor was right where he wanted to be: Playing professional baseball, his stated life goal since kindergarten. The next four and a half years were spent grinding in the minors. He hit 18 home runs for Single-A Asheville his second season, then struck out 183 times in 130 games for High-A Modesto. 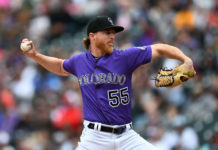 He split time between High-A and Double-A in 2014, and Double-A and Triple-A in 2015, before catching his break with all the Rockies’ uncertainty at shortstop entering 2016. The minors are a weeding out process, a chore if you’re not blazing through like every prospect dreams. Only the disciplined and determined battle through. Story’s belief in himself never wavered. His perspective is to remain humble. He learned it from his parents, who always taught him and Tyler that the world is bigger than them. The parents lived it out in their careers – Kenny has been serving others as a firefighter for more than 30 years with the Irving Fire Department, and Teddie as the CEO of Irving Cares, a non-profit committed to providing essential services to Irving residents in need. Humbleness as a virtue was further imparted on the boys at Oak View Baptist Church every Sunday growing up. So, when Trevor is asked about the pressure on him entering 2017, his first year as a fully entrenched major league starter, with much higher expectations of production as opposed to this time a year ago, he’s not concerned. If Story ascends to where he wants to be, bringing the Rockies along with him, he’s certain to have even less privacy when dining out.